Wright designed many decorative details for the Midway Gardens. 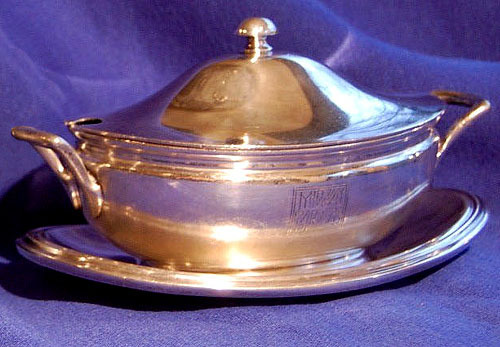 Was this silver dish (above) produced for Wright's Midway Gardens or some other? That was the question we attempted to unravel. We did an extensive search through everything that was published about the Midway Gardens. We also contacted the Meriden Historical Society. It is conclusive that Wright designed many of the details and furnishings for the Midway Gardens. Sculptures, vases, leaded glass windows, interior tables and chairs (two designs, M3 pl 493, 494), garden furniture (two variations, M3 pl 497, 498), linen, lighting, china and a silver vase. He also designed the monogram that appeared on many items. Like the monograph applied to items at the Imperial Hotel, the monograph appeared on many items not designed by Wright like the Beer Stein (Fig. 5) and Tea Pot (Fig 7). It is also clear that items were ordered that did not have Wright's touch. Wright designed two versions of a garden table and chairs for the exterior Summer Garden. This design was never executed. They chose a white wood set instead. 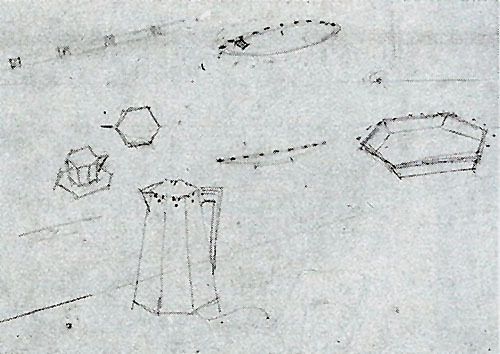 A design for a beer stein (Fig. 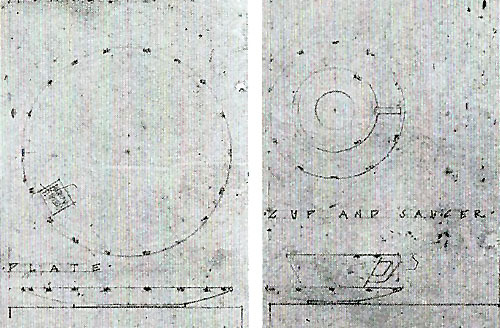 5) was included in one of Wright's drawings, and was more of a geometric design than the one that was used and engraved with the Midway Garden Monogram. 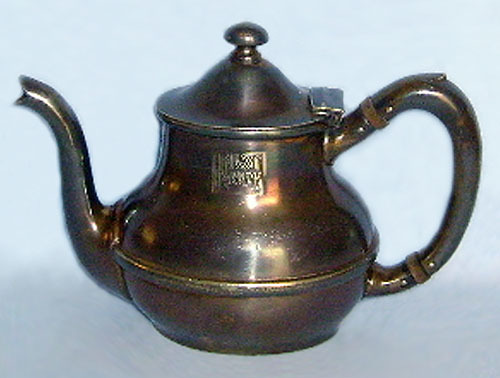 The Coffee Pot Wright designed for Midway Gardens was a variation of the design for the Imperial Hotel (Fig 7c), very geometric in shape. 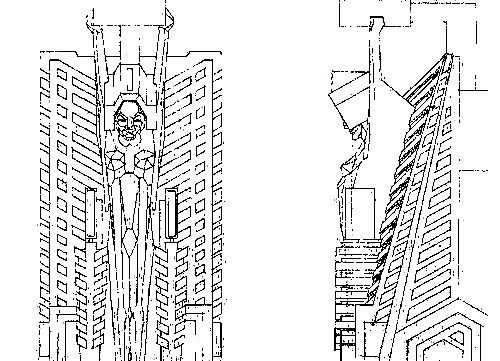 Wright's design was not selected. 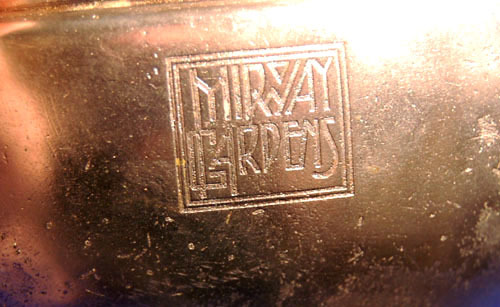 The Midway Gardens Coffee / Tea Pot was most likely ordered from a catalog and imprinted with the MG Monogram (Fig 2c). Hence we come to this silver dish (above). First a number of questions arise. Who manufactured it and when was produced? Were there other Midway Gardens? We start with the markings on the bottom. Top: "00274, Midway Gardens" (Fig 10c). This piece is numbered, but the Meriden Historical Society did not have a record that matched. Of interest is the minute mark between and below the "...y G..." in Midway Gardens. It is approximately 1/64" in size. It is a stamped "W" inside a "C". It resembles the original mark used by The Watrous Mfg. Co., which merged with Meriden Britannia in 1898. Barbour Silver Company, Hartford, Conn.
Derby Silver Company, Derby and Meriden, Conn.
Holmes & Edwards Silver Company, Bridgeport, Conn.
Middletown Plate Company, Middletown and Meriden, Conn.
Rogers and Brothers, Waterbury, Conn.
Rogers and Hamilton, Waterbury, Conn.
Rogers, Smith & Co., Hartford, Conn.
Simpson, Hall, Miller & Company, Wallingford, Conn.
Watrous Manufacturing Company, Wallingford, Conn.
Wilcox Silver Plate, Meriden, Conn.
William Rogers Manufacturing Company, Hartford, Conn.
Each firm continued to stamp their maker's mark on designs, but marketing and production was at the same expanded facility. Left: "Crown" with two triangles, "Wheat? ", "Star" (Fig 10e). All three are stamped, and unidentified. Right: "Shield with small Star in a Crescent" (Fig 10f). Note: Manhattan Silver Plate, one of the companies that joined MB, had a Star within a Crescent mark (TM p148). The second is a "Scale within a Shield". Examples of this can be seen on MB items as late as 1951. The third is a "Thistle within a Circle". All three are stamped. After an exhaustive study of the markings on the bottom of the piece, the conclusion seems to be that the piece was produced after the merger in 1898, and before 1930, so it fits the time frame of Wright's MG. Were there other Midway Gardens during that time period? There may have been one or two, but it would have had to have been a sizeable facility in order to place an order like this and customized it with your name imprinted and numbered. There were no other sizeable "Midway Gardens" during that time period. If this was used at Wright's MG, why would this piece not have the MG monogram? It may have been the size of the piece itself and its use. 1" in height, 5.5" wide, with the smaller bowl being 3.75" wide. 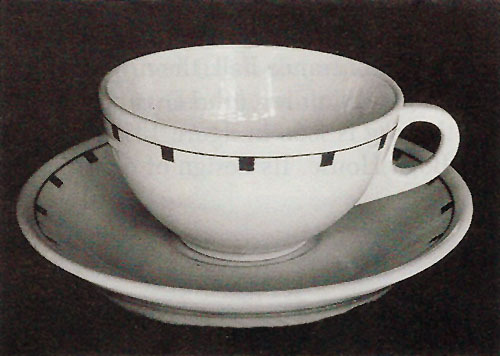 The MG Cup and Saucer was designed without the monogram, and was produced without it. 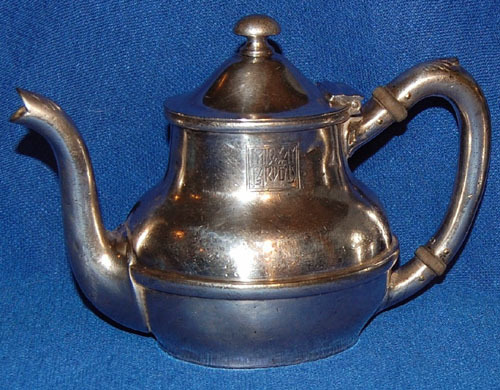 There were a very limited number of Imperial Hotel silver coffee services that survived. Some were imprinted with the IH monogram and some without. The only place for the monogram on this piece was the inside bottom of the dish, and if it was used as a condiment, small serving bowl or candy dish, the monogram would have been covered, hence no need to stamp it in a visible area. Of interest is the design itself. It is consistent with Wright's geometric designs for Midway Gardens. 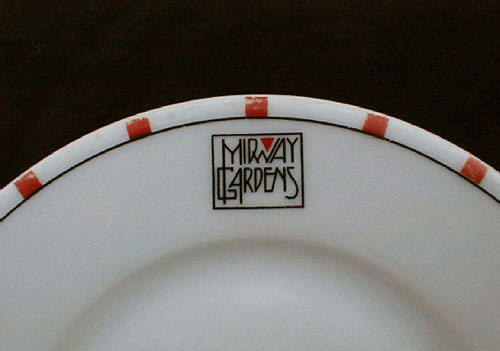 The perforated setting surrounding the edges of the "bowl" and "tray" mirrors the front of Midway Gardens (Fig 9d), the details of Wright's "Queen of the Garden" sculpture (Fig 9e) and is stereotypical of Wright's Prairie style. 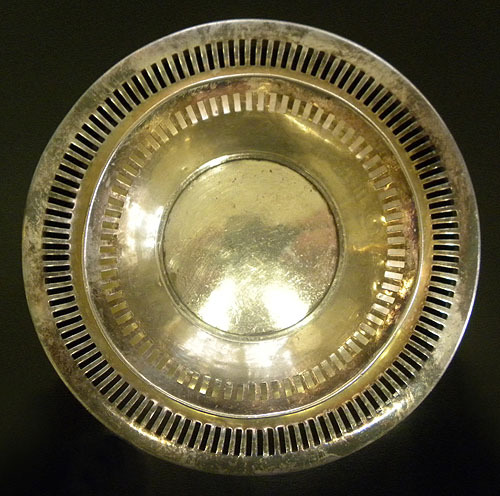 Our summary is not conclusive, but we would lean toward the conclusion that this silver dish was not designed by Wright, but was used in Wright's Midway Gardens, and most likely ordered from a catalog, and ordered in a quantity that would allow Midway Gardens to imprint the bottom. 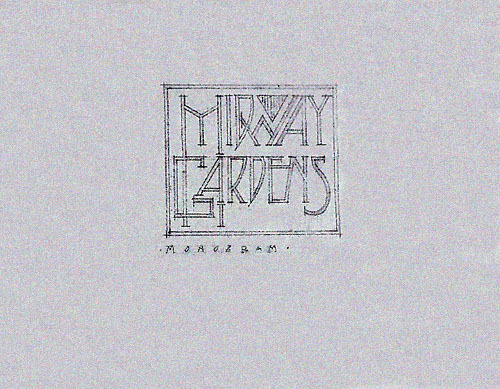 August 31, 1921 Sold to E. C. Dietrich Midway Automobile Tire and Supply Company and became the "Midway Dancing Gardens"
1: Midway Gardens Oval Platter. Designed by Frank Lloyd Wright. Manufactured by Bauscher, Weiden, Germany. 1914. Courtesy of The Minneapolis Institute of Arts. 1b: Table setting designed by Frank Lloyd Wright. 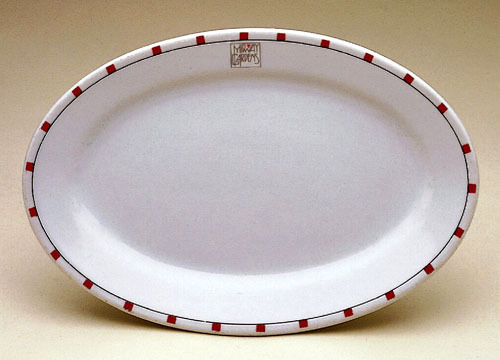 Includes example of plate design. Courtesy of the Frank Lloyd Wright Foundation. 1b: Detail of the Plate and the Cup and Saucer designed by Frank Lloyd Wright. Plate design included MG monogram. Cup and Saucer design lacked monogram, and was produced without it. Courtesy of the Frank Lloyd Wright Foundation. 2: Midway Gardens Plate. Designed by Frank Lloyd Wright. Manufactured by Bauscher, Weiden, Germany. 1914. 2b: Detail of Midway Gardens Plate. Designed by Frank Lloyd Wright. Manufactured by Bauscher, Weiden, Germany. 1914. 2c: Midway Gardens Monogram designed by Frank Lloyd Wright. Courtesy of the Frank Lloyd Wright Foundation. 2d: Midway Gardens Plates. Designed by Frank Lloyd Wright. All four are marked on the back with "New York-Chicago Bauscher Weiden (Germany) 1914". Top: Large round soup or salad 9" across. Impressed mark in oval "Bauscher Weiden", and impressed away from the other marks is "23". Center Left: Large platter. 9 3/4" by 6". Impressed mark in oval "Bauscher Weiden", and impressed away from the other marks is "00". Center Right: Small platter. 7" by 4 1/4". Impressed mark in oval "Bauscher Weiden", and impressed away from the other marks is "00". Foreground: Small round plate 6" across. Impressed mark in oval "Bauscher Weiden", and impressed away from the other marks is "15". (The Impressed Numbers may have to do with the shapes of the pieces. Two platters are marked with "00". The small plate "15" and the large Bowl "23".) All are manufactured by Bauscher, Weiden, Germany. 1914. Photograph courtesy of private collector. 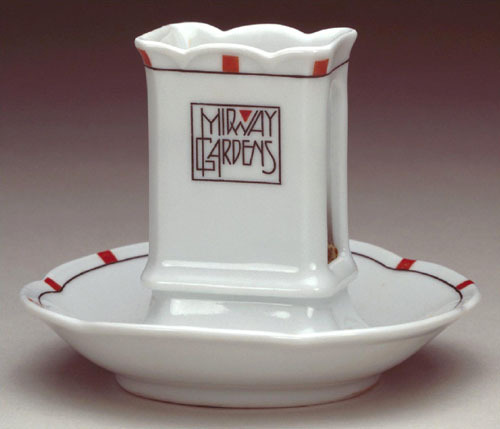 3: Midway Gardens Cup and Saucer, 1914. Designed by Frank Lloyd Wright. 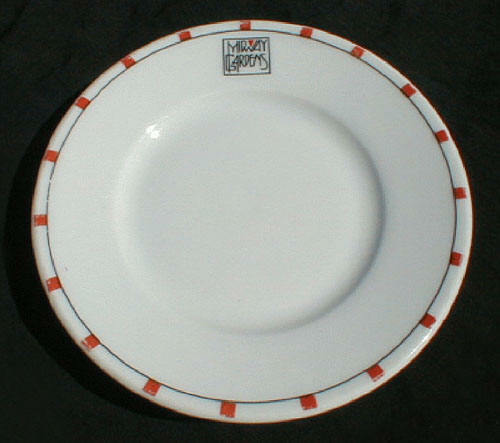 The Midway Gardens Cup and Saucer was designed without the monogram, and was produced without it. Note: Pattern is inversed on this Sup & Saucer. Squares are below the line, not above like on all the other patterns. This was John Lloyd Wright's Cup & Saucer. It was manufactured by Shenango China, New Castle not Bauscher, Weiden, Germany which manufactured all the other Midway Gardens ceramics. This could account for the difference. Courtesy of David Hanks, Decorative Designs, 1979, p 125. 4: Midway Gardens Ash Tray and Match Holder. Not verified as a Wright designed. Most likely the red squares and monogram adapted to ash tray. Manufactured by Bauscher, Weiden, Germany. 1914. Courtesy of The Minneapolis Institute of Arts. 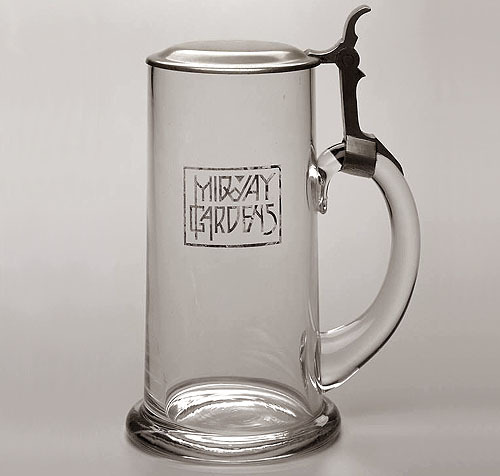 5: Midway Gardens Beer Stein. Not verified as a Wright designed. A design for a beer stein was included in one of Wright's drawings, and was more of a geometric design than this one that was used and engraved with the Midway Garden Monogram. Glass and pewter. 7" x 4" x 5". 1914. Courtesy of The Minneapolis Institute of Arts. 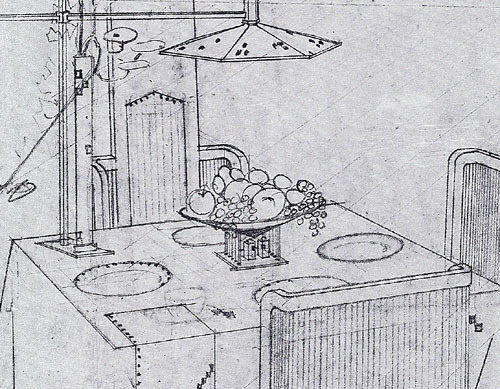 5b: Detail of table setting with rendering of Wright's concept for a Midway Gardens Beer Stein (right side of table). Design was never realized. Courtesy of the Frank Lloyd Wright Foundation. 6: Midway Gardens Soup Terrines with Midway Gardens monogram. Left: Two Pint Soup Terrine. 9 5/8" long Handle to Handle by 4 3/4" wide by 3 1/4 Tall at the center. Right: One Pint Soup Terrine. 8" long handle to handle by 4 1/4" Wide by 2 1/2" Tall at the center. When combined, the One Pint Soup Tray, Terrine and Lid is 4 1/2" Tall to the top of the lid. The owner purchased the One Pint Soup Terrine at a antique store in his neighborhood, which is no longer in business. Photograph courtesy of private collector. 6b: Midway Gardens Soup Terrine with Midway Gardens monogram. Two Pint Soup Terrine. 9 5/8" long Handle to Handle by 4 3/4" wide by 3 1/4 Tall at the center. Photograph courtesy of private collector. 6c: Midway Gardens Soup Terrine and Base with Midway Gardens monogram. One Pint Soup Terrine. 8" long handle to handle by 4 1/4" Wide by 2 1/2" Tall at the center. When combined, the One Pint Soup Tray, Terrine and Lid is 4 1/2" Tall to the top of the lid. The owner purchased the One Pint Soup Terrine at a antique store in his neighborhood, which is no longer in business. Photograph courtesy of private collector. 6d: Detail of the Midway Gardens Soup Terrine's monogram. 7: Midway Gardens Tea Pots with Midway Gardens monogram. Left: One Pint Tea Pot. 5 1/2" Tall by 7 1/2" Wide Handle to Spout. Right: Two Pint Tea Pot. 5 3/4" Tall by 8 1/2" Wide Handle to Spout. Photograph courtesy of private collector. 7b: Midway Gardens Tea Pot with Midway Gardens monogram. One Pint Tea Pot. 5 1/2" Tall by 7 1/2" Wide Handle to Spout. Photograph courtesy of private collector. 7c: Midway Gardens Tea Pot with Midway Gardens monogram. Two Pint Tea Pot. 5 3/4" Tall by 8 1/2" Wide Handle to Spout. Photograph courtesy of private collector. 8: Midway Gardens Soup Terrines (2) and Tea Pots (2) with Midway Gardens monogram. Left to Right: Two Pint Tea Pot, Two Pint Soup Terrine, One Pint Soup Terrine with Tray and Lid, One Pint Tea Pot. Photograph courtesy of private collector. 9: Midway Gardens Tea Pot. 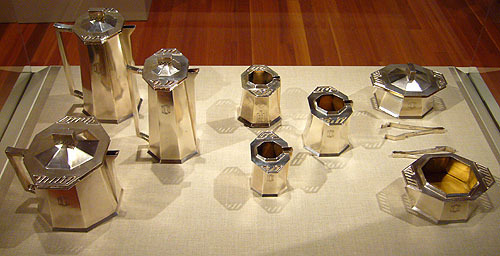 The Coffee Pot Wright designed for Midway Gardens was a variation of the design for the Imperial Hotel, very geometric in shape. 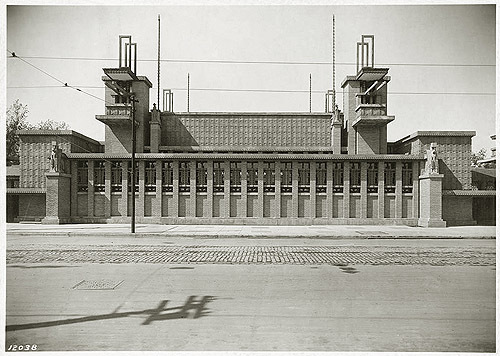 Wright's design was not selected. 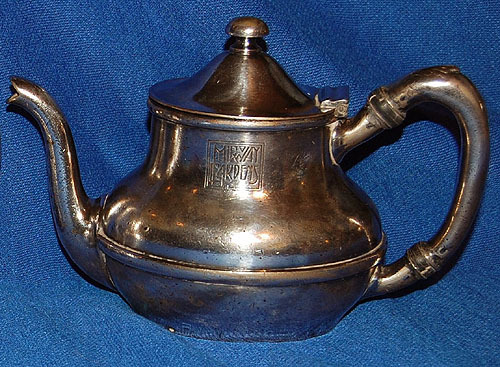 This Midway Gardens Coffee / Tea Pot was most likely ordered from a catalog and imprinted with the MG Monogram. 1914. History of this Tea Pot: My Great Aunt and Uncle lived in Joliet, and used to visit Midway Gardens back in the 1920's, they loved the restaurant and the bands that played there. They were at the restaurant on one of their visits and my Great Aunt did not feel well that evening, as she thought she might be expecting a Baby. The tea that evening was the only thing that calmed her, so she had their chauffeur purchase a tea pot full of hot water and the cup of tea for the drive home. Over the years she told our family about the unpleasant drive home from that evening, and the other exciting evenings at Midway Gardens. Courtesy of Jeanne, Happy Trails, Ruby Lane. 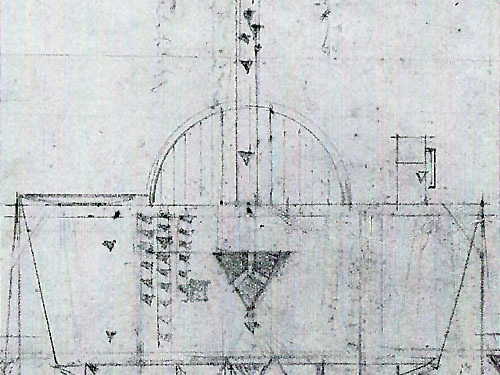 9b: Detail of Wright's concept for a Midway Gardens Coffee Server. 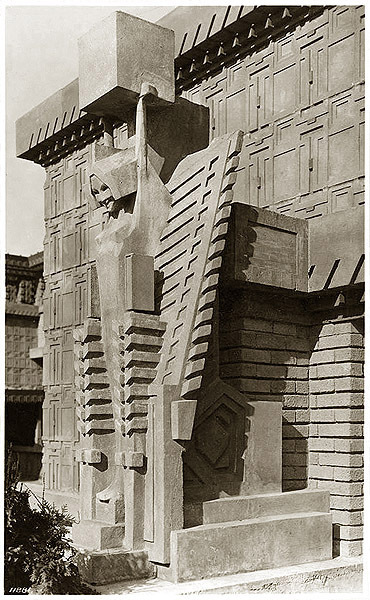 The designed was a variation of the design for the Imperial Hotel, very geometric in shape. Design was never realized. Courtesy of the Frank Lloyd Wright Foundation. 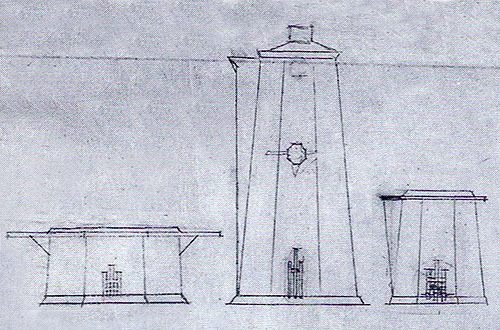 9c: Detail of Wright's concept for a Imperial Hotel Coffee Server. Courtesy of the Frank Lloyd Wright Foundation. 10: Midway Gardens Fruit Bowl designed by Frank Lloyd Wright. This design was never realized. In 1988, through an agreement with the Frank Lloyd Wright Foundation, Tiffany & Company executed this design. Made of sterling silver, 14 inches wide, 5.5 inches high. $11,250. Courtesy of the Frank Lloyd Wright Foundation and Tiffany & Company. 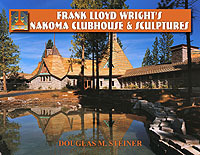 For additional information see "Frank Lloyd Wright, Decorative Designs Collection", 1988, 1990. 10b: Table setting designed by Frank Lloyd Wright. Includes example of Fruit Bowl. Courtesy of the Frank Lloyd Wright Foundation. 10c: Table setting designed by Frank Lloyd Wright. 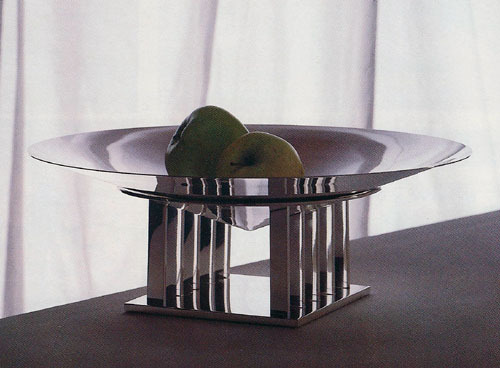 Includes example of Fruit Bowl. Wright also designed the linen table cloth and napkin. The design included the MG monogram and the "Red Squares" border. Courtesy of the Frank Lloyd Wright Foundation. 11: The design of this piece is consistent with Wright's geometric designs for Midway Gardens. It is 1" in height, 5.5" wide, and the smaller bowl is 3.75" wide. 11b: The perforated setting surrounding the edges of the "bowl" and "tray" imitates the Wright designed place setting, and mirrors the front of Midway Gardens, the details of Wright's "Queen of the Garden" sculpture and is stereotypical of Wright's Prairie style. 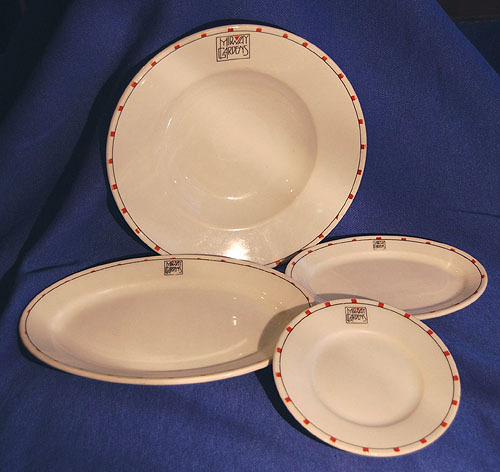 11c: The perforated setting surrounding the edges of the "bowl" and "tray" imitates the Wright designed Midway Gardens place setting. 11d: The perforated setting surrounding the edges of the "bowl" and "tray" mirrors the front of Midway Gardens Winter Garden and is stereotypical of Wright's Prairie style. 11e: The perforated setting surrounding the edges of the "bowl" and "tray" mirrors the details of Wright's "Queen of the Garden" sculpture and is stereotypical of Wright's Prairie style. 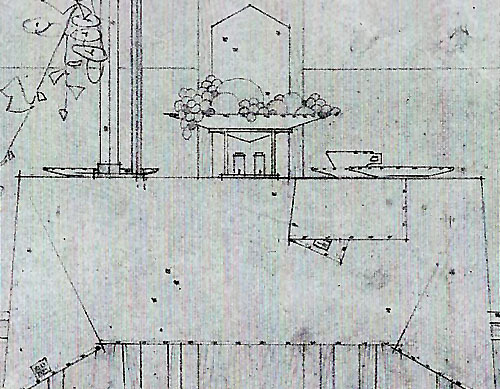 11f: This drawing of Wright's "Queen of the Garden" sculpture accentuates the similarities with the perforated setting surrounding the edges of the "bowl" and "tray". 12: This view is looking straight down at the dish. It is flipped over in the next photograph. 12b: This view is of the bottom of the dish. 12c: Top: "00274. Midway Gardens." This piece is numbered, but the Meriden Historical Society did not have a record that matched. Of interest is the minute mark between and below the "...y G..." in Midway Gardens. It is approximately 1/64" in size. It is a stamped "W" inside a "C". It resembles the original mark used by The Watrous Mfg. Co., which merged with Meriden Britannia in 1898. 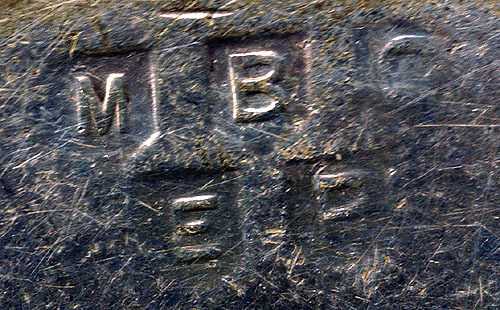 12d: Bottom: "M B C E P" each has raised letter within a stamped box. This have been identified as Meriden Britannia Company Electro Plate. 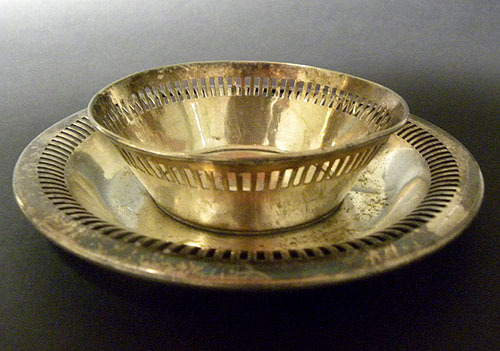 Meriden, Connecticut, was the American capital for pewter and silver manufacture in the 19th century. The Meriden Britannia Company was formed in 1852, in Meriden, Conn. They initially manufactured products using a metal alloy called Britannia, approximating the appearance of pewter. In the late 19th century, when silver began replacing pewter in American homes, they also produced silver plated products. In 1898, they were one of the major companies that formed International Silver. MB continued to use their marks into the 1930's. 12e: Left: "Crown" with two triangles, "Wheat? ", "Star". All three are stamped, and unidentified. 12f: Right: "Shield with small Star in a Crescent". 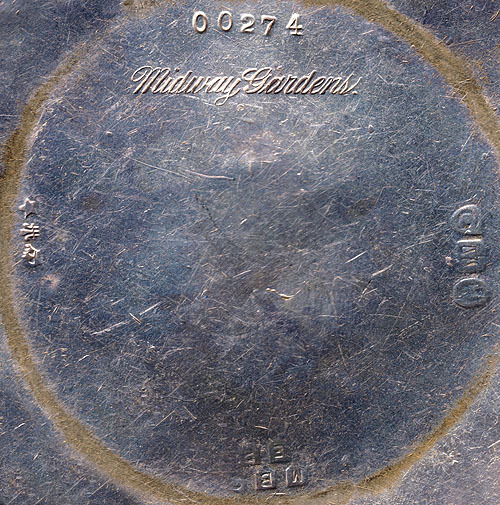 Note: Manhattan Silver Plate, one of the companies that joined MB, had a Star within a Crescent mark (TM p148). The second is a "Scale within a Shield". Examples of this can be seen on MB items as late as 1951. The third is a "Thistle within a Circle". All three are stamped. 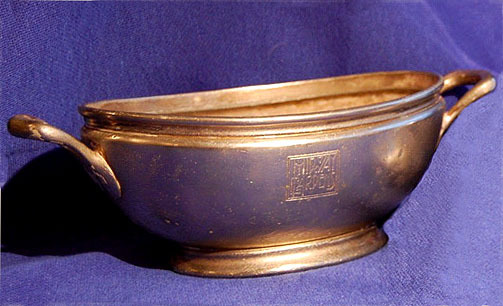 Our summary is not conclusive, but we would lean toward the conclusion that this silver bowl was not designed by Wright, but was used in Wright's Midway Gardens, and most likely ordered from a catalog, and ordered in a quantity that would allow Midway Gardens to imprint the bottom. We welcome any research you can share with us concerning this item.